Is your writing feeling dull and sluggish, following the weather trends outside? Maybe it’s time for spring cleaning. Perhaps your writing space has gotten cluttered over the winter; papers piled up, scribbled notes on scrap paper, unopened mail. Or is that just me? Take a few hours and go through those things. Touch it once! Toss it, file it, or take action. Move around your monitor and give your desk a good dusting. It’s like uncluttering your mind so you can focus and not feel so overwhelmed by the things that have taken over your writing space. Or maybe it’s time to shake up your location altogether. If you usually sit at a desk, why not try your favorite couch or armchair? What about trying the library or a coffee shop? Dedicate a week to experimentation. Try a different location every day. Narrow it down to your two favorites. The next week, spend three or four days in one location, and three or four days in the other. Which feels best? What did you like about each one? Can you think of a place that has the best of both? Some people thrive on change (that would be me!). Others need consistency and order. But if you think you are one way and have never tried the other, how will you know? Personally, I think I’ll try both techniques. I’ll clean off my desk AND try writing somewhere else. I usually run in and out of the library so quickly with no time to stop and enjoy all they have to offer. The armchairs in the nooks look cozy, but I won’t know until I try. Noise distracts me, so although I love me a latte, a coffee shop would not be very conducive to writing for any length of time. I’ve tried this on numerous occasions when traveling. I always have my laptop and pull it open to knock out a few paragraphs before rushing off to my next appointment. I think I’ll give silence a try. Make this spring a time for fresh starts and new adventures. 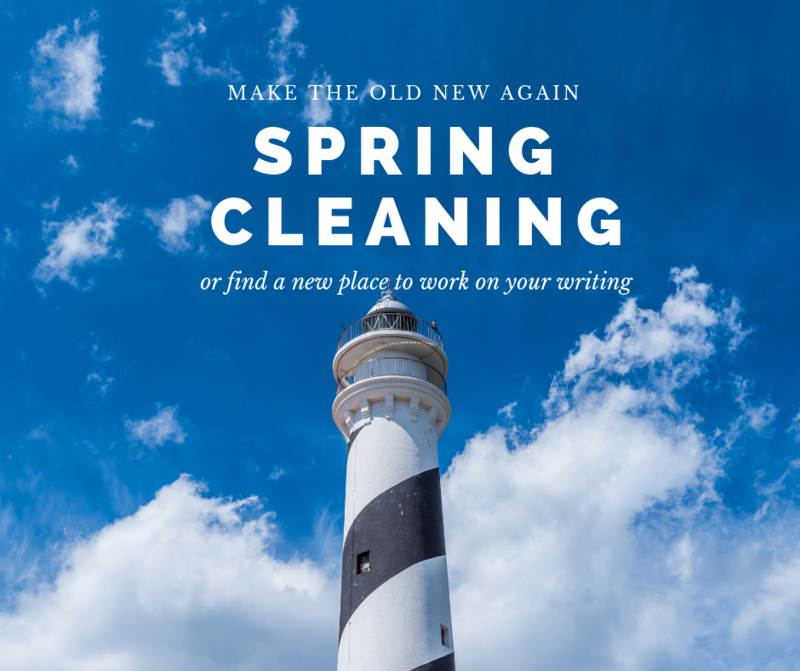 Let’s clean out the cobwebs and get back to writing.